Peter Ackroyd’s London: The Biography describes Shoreditch in the 17th century as a disreputable and dangerous place. Gentlemen would pass beyond the walls of the City to indulge themselves out of sight of the more respectable neighbourhoods of London. Spitalfields was already notorious for its poverty and filth, its narrow streets, and mean houses. These days the City makes ever-deeper incursions into the old East End, rendering the ancient architecture polite with Farrow & Ball colours, threading artisanal coffee shops and organic eateries into the lanes. There is a Chanel boutique in Spitalfields market now. Glossy steel and glass edifices are beginning to creep up Bethnal Green Road. 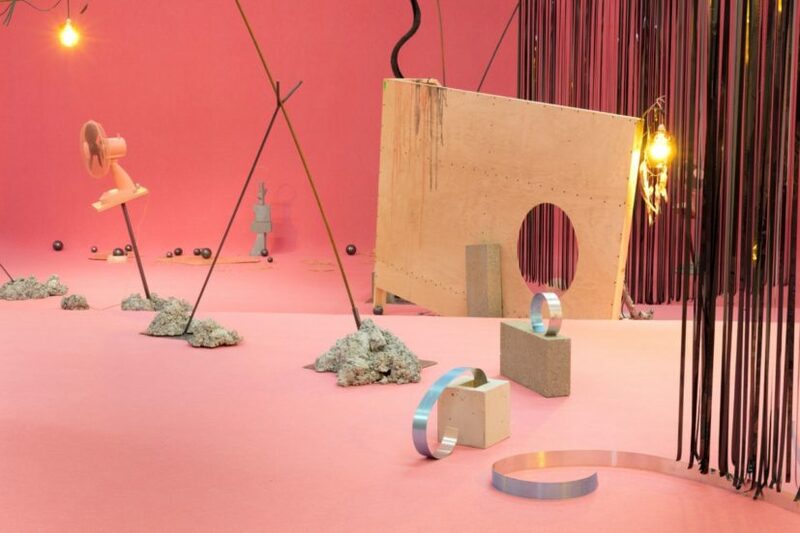 This Saturday, for one night only, the neighbourhood, centring on the Whitechapel Art Gallery will host the second London Art Night. Ten artists have been commissioned by curator Fatoş Üstek to make new work, sited in a variety of evocative and historic venues around the area. There is something wonderfully romantic about an exhibition that only begins as the day fades away, which encourages you to forego sleep in favour of adventure. After dark the city changes its character, becomes other, embraces behaviours that would not be dared, nor tolerated in the light of day. The Contemporary Art Society has supported the commission of a new installation by London-based artist Anne Hardy. After Art Night the work will become the first of Hardy’s increasingly ambitious installation works to enter a permanent museum collection. 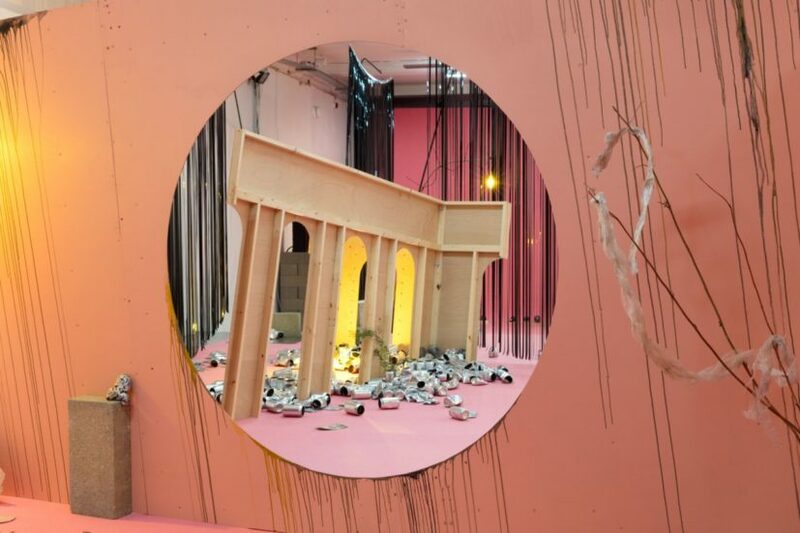 This is her largest ever single installation, and for those who saw the exhibitions in Oxford or Glasgow in 2015, an exciting evolution of the formal language has developed through those back-to-back shows. You will enter the old Nicholls and Clarke building from the busy Shoreditch High Street side, coming into a spartan space in which you are gently relieved of your shoes and bags. 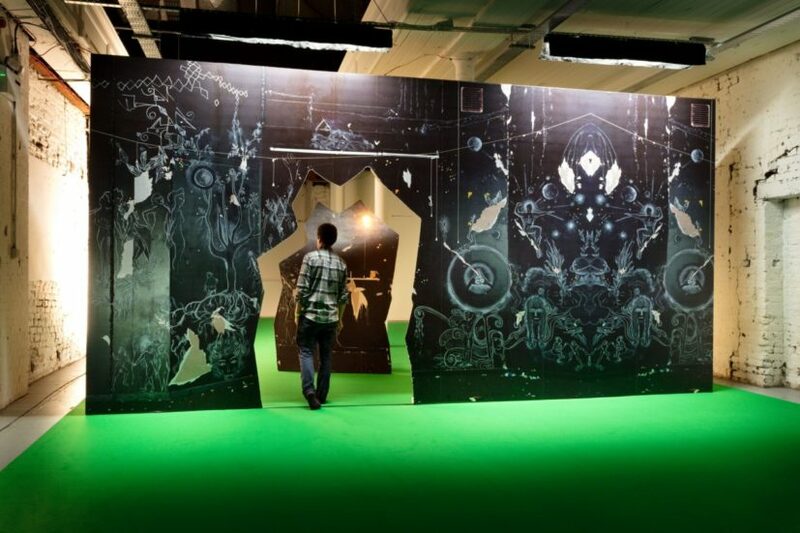 Thus prepared and unencumbered, you will be ushered on to a second space, carpeted in emerald green where you will step through a billboard-scale photographic work into the installation beyond. (I think the lightest reference to stepping through a looking glass is permissible here.) The billboard image includes figurative chalk drawings on a black wall. Obscure narratives appear to unfold, but you won’t have time to decipher them, even if you could. It is important, however that this second threshold introduces the notion of fiction, or illusion, as well as anchoring the experience in the discourse around photography. The entrance to the main space of the installation is via another frame, a tilting plywood wall with a circular aperture through which the work beyond is glimpsed. An almond pink carpet fills the space, operating, as in earlier works, as a field upon which the myriad incidents and mise-en-scène unfold. Sound, deployed as a sculptural material, has increasingly found its way into Hardy’s work in recent years. The current installation makes it a protagonist, with a strong spatial quality, a programmed quadrophonic soundtrack that loops over the course of a few minutes. Hardy talks about the sound here as a series of “atmospheres”. As I walked in, a cloud burst of rain was thrumming on a roof; followed by the squawking of the interloper green parakeets, now habitués of the area. Heavy metal objects are heard to roll over cobbles, gas capsules skitter across the floor, the artist (we presume) sighs. In concert with the sound element the lighting in the space also cycles through a programmed sequence, beginning brightly and dimming towards the end. A chorus of pink desk fans like a mechanical dawn quietly come to life, panning back and forth and making glossy black curtains of VHS tape flutter languorously. One could think of the installation as theatrical, but only in the sense that it performs itself. The repeating cycles of sound and light introduce time as an element here, and the visitor becomes a passenger, all senses dilated to capture the finely calibrated effects. Everything here is tilting, apparently teetering, propped up precariously and seemingly on the brink of collapse. Looking across from the entrance, one is put in mind of a cityscape, or perhaps a garden. Some of the taller structures occasionally take on an almost anthropomorphic quality: an attenuated re-bar figure towers up to a lollipop tangle of plastic tape. It has the awkward vulnerability of a Giacometti walking figure. But nothing here is what it seems. There are slender branches, and metal casts of the same; humble polystyrene chips are cast in aluminium, hand-blown glass shades over light bulbs appear still to be in a molten state. Mundane reality is revealed as entirely illusory; each three dimensional composition has a provisional, almost arbitrary quality that seems to suggest it could, at any moment, assume another form. Things are balanced, pegged and anchored with guy ropes. The liminal spaces of the city are evoked in drifts of objects piled in corners. A tumble of flattened beer cans suggests activity that seeks to carve out its own space of self-determination. And lest that should look like dereliction, one can is upturned to hold sprigs of wild flowers. Humanity persists in the flows of material that morph and transform in their passage through the metropolis. Altered states of mind are evoked by accumulations of silver nitrous oxide capsules. Familiar as morning-after detritus on the pavements outside clubs in the area, they are rendered strange through being accompanied by cast capsules in bandage pink. The final part of the main space takes the visitor down a steep ramp, to where a number of steel spheres of varying sizes seem to have rolled, and a little tower of broken concrete puts one in mind of Neolithic standing stones whose ritual purpose is lost to the centuries. Then before you know it you will be back out in the night again, in the sulphur yellow of streetlights and wail of sirens. The Art Night format makes procrastination impossible – you just have to get out and see it before it dematerialises again.